For this card I started by die cutting the main panel using Cool cuts Double Stitched Rectangles and the inked the sky using Distress inks . Next I coloured this adorable images from Bear mail stamp set using Polychromos pencils and then fussy cut them. Being in Create a Smile challenge team some products are sent to me , but the opinions are mine and I share only products that I love. 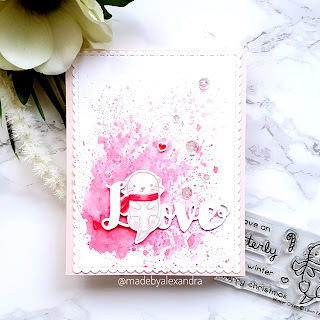 While I wasn't sure if I should do a Valentine's day cardmaking serie I then decided that instead of doing only Valentine's related I will do also friendship cards too. 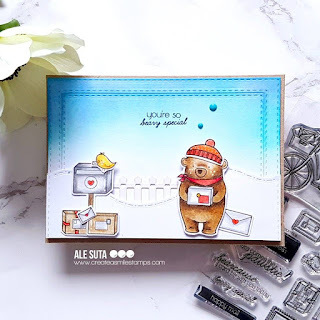 Next I picked up the adorable Winter otter stamp set from Lawn Fawn which is coloured using Polychromos Pencils from Faber Castell . Last I added the die cut word from Simon Says Stamp and some Pretty Pink Posh sequins. For the background I just used some distress ink and the images are coloured using Polychromos pencils . The first card is an Clean and Simple one and wanted the coloring to be the focal point . I stamped the image using Mememto Dew Drops ink in Desert Sand colour and using my Spectrum Noir Alcohol Markers I tried to achieve the no line coloring . Inked the background using Distress ink - Peacock Feathers , added the sentiment and some Pretty Pink Posh sequins and the card is finished . For the second card I am using Lawn Fawn - Stitched Hillside Backdrop Portrait dies and also Puffy Clouds borders to create the main panel. Inked the sky using the same Peacock Feathers ink and the adhered everything using foam tape . You can also check the video that I created for this two cards. 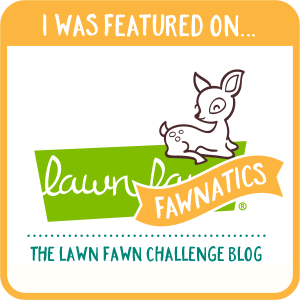 Stopping today to inspire to hop over at Create a smile blog and to check out the new challenge that has started today ! 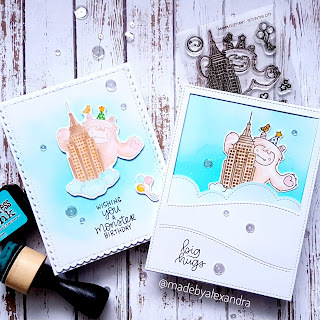 So since the theme of the challenge is Tag it I took the Cool cuts - Pocket tag and the Beast feast stamp set and created this adorable tag . 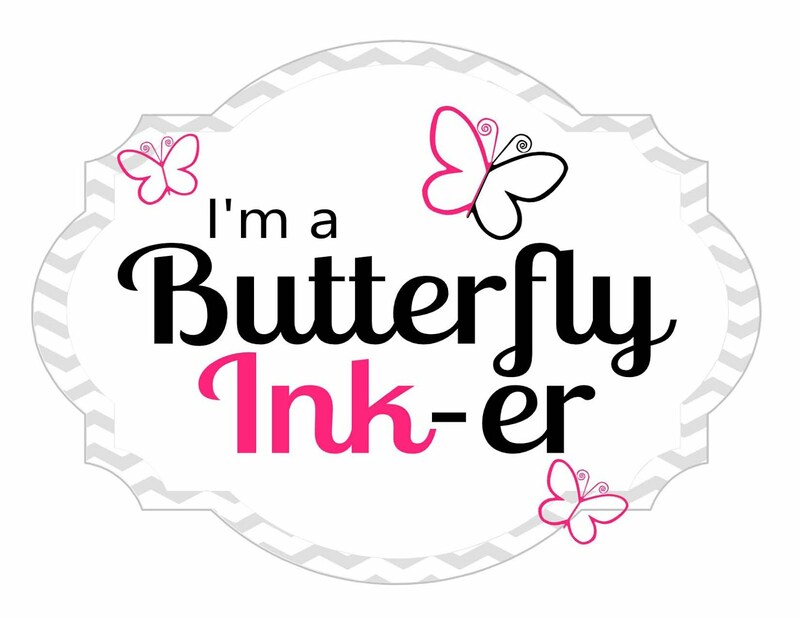 I have some exciting news too : I am thrilled to let you know that I am the new DT challenge coordinator for Create a smile stamps . When I discovered Create a smile stamps maybe like a year and half ago I was very impressed , and immediately felt in love by their unique designs and the fact that they are located in Germany was a bonus ( cause I don't have to wait to long for the happy mail to arrive :)) So being already a fan girl :) when Christine ( the owner of Create a smile ) asked me if I wanna be their DT Challenge Coordinator I was so happy and being grateful. 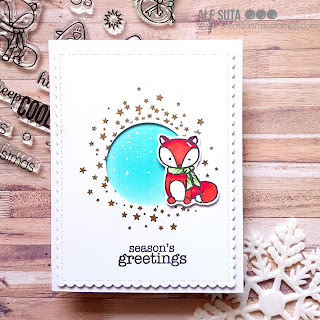 Stopping today to share my first card from this year , and I know you are used to see a lot of cute critters , but I want to challenge myself to try different designs and techniques this year. So for this card I decided to pick the stamp set from Create a smile called In bloom and color the images using the no line coloring technique using my Spectrum Noir Alcohol Markers . 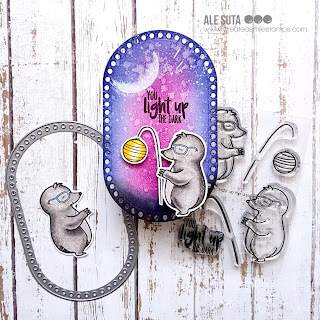 I started by stamping the images using a light ink color and then adding layers of color with my markers from dark to light, until I was happy with how the image turned out. 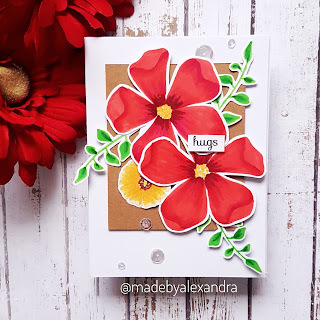 I will also have a video on sharing step by step the process of making this card , so feel free to check it out . Finishing this card with some Pretty Pink Posh sequins . Thank you for stopping by ! have a lovely day !